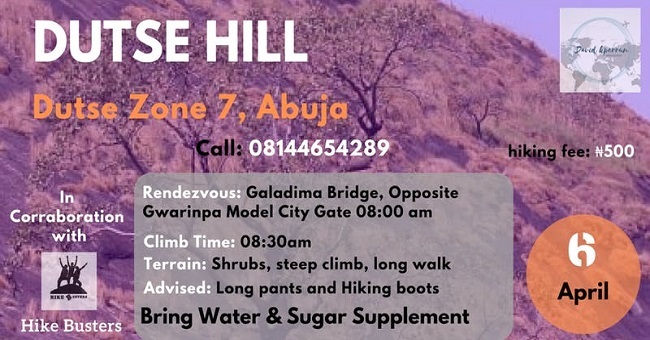 Saturday morning climb of Dutse hill, Abuja. Rendezvous time: 08:00 am at Galadima Bridge, Opposite Gwarinpa Model City gate. A great start for the Hiking newbies (first-time hikers), a magnificent hill to start the month of April with. So first thing on Saturday morning, April 6th, wake up early and put on your good hiking shoes. Call 08144654289 for details and inquiries. We’re all wanderers on this planet, the world is a big space to explore. So come, let’s walk the trail together.